It was never a question of if Laura Irwin of Hartland would join 4-H, but rather, when she would become a 4-H member. “My mom always wanted to be a 4-H member, and never had the opportunity,” Laura recalls. “So, she made sure her children did. I joined when I was 7-years old, and I’m still a volunteer and junior advisor for the Hartford County 4-H Fair Board. Laura was a member of the Granby 4-H Club, and quickly seized every opportunity offered. She started riding horses when she was 8 years old, and then developed a 4-H goat project when she was 12. At age 16, she began a beef cattle project, and then swine came after that. Laura’s beef and swine projects were through the Gilbert family of North Granby, longtime 4-H volunteers. She also volunteered with the Hemlock Knoll 4-H Club. Laura always tries to maintain a positive attitude, and you quickly realize this while talking to her. She handled the increasing responsibility and challenges of multiple 4-H projects with the same poise, determination, and professionalism that she demonstrates on a daily basis. Her experience in 4-H has enhanced her course work here at UConn. Material being covered in Introduction to Animal Science, Genetics, Pathobiology, and Physics courses is all an extension of the knowledge she gained through her 4-H career. Earning the respect of her riding instructor and having her 4-H project work come full circle were the most rewarding parts of 4-H for Laura. She began taking lessons with Lisa Dinsmore when she was 8-years old, and now Lisa looks at Laura as a knowledgeable horse person, and an equal. 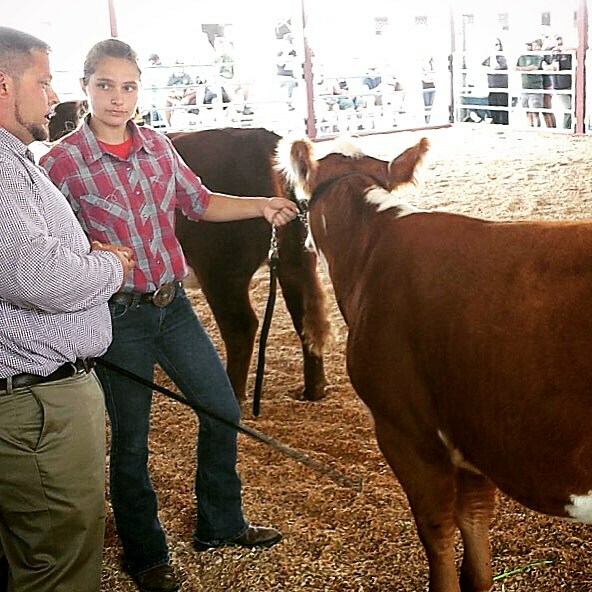 Laura worked with her Hereford beef cow and calf every morning during her last year in 4-H and was Reserve Grand Champion Showman of Goshen Fair in 2015. Laura was able to see her calf grow up, have her own calf, and Reserve Grand Champion in the Cow-Calf class at the highly competitive Big E. The calf represents the third generation of Laura’s 4-H project work with that beef cow family. This entry was posted in 4-H Youth, Agriculture, Community, Education, Family and tagged 4-H, Hartford County 4-H, livestock project, STEM, UConn Extension, UConn undergraduate, veterinary science.